Sometimes the ideas just have to play through, and I have to execute the silly inside joke to just get it out of my creative way. My husband and I are both lucky enough to have rather healthy parents, all 4 of them are in their 80’s. Hearing skills, not so much. On a recent visit, one of the oldsters was describing a sound as something from a CHIMPANZEE. The other oldster in the room processed the word as GYM PANSY. And just couldn’t quite make the connection to the actual word. I thought I would pee my pants laughing when the story was relayed to me. All I could see was a chimpanzee in a Halloween type costume (think Elizabethan collar purple pansy) at our gym. This is what happened. Offspring3 will appreciate it. 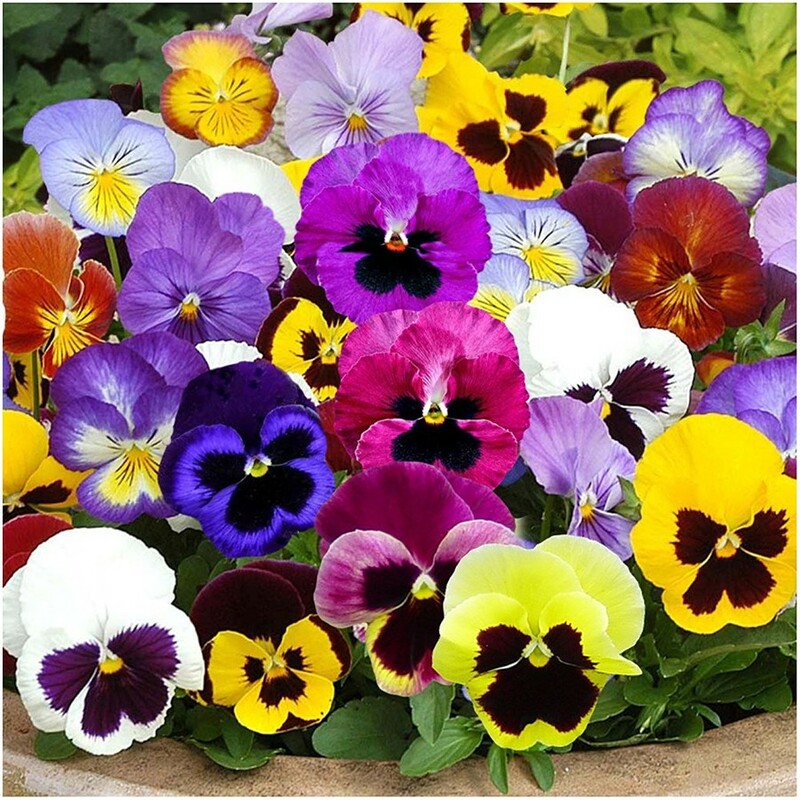 I do remember my mother planting pansies at our house in Connecticut (we lived there for almost 8 years – I was 3 – 10 years old). I remember weeding the flower beds. I don’t remember her ever planting them at other houses we lived in. I will have to ask her if there was something special about the soil or climate that led to her choice. Or if it was just something my grandfather (he could grow anything!) suggested. Supplies: Stamps – Avery Elle, Lawn Fawn, Paper Salon, paper – Neenah Classic Crest Solar White, Office Depot transparency, Stampin’ Up! Basic Black, Basic Gray, inks – Copic C3, G03, V04, V17, Gina K Designs Wild Lilac, VersaFine Onyx Black, Vintage Sepia, dies – Poppystamps (window), Provo Craft (alphabet), embossing powder – Filigree Fine Art Powder clear. Categories: card, hello, note | Tags: Avery Elle, card, Copics, Gina K. Designs, Lawn Fawn, Neenah, Paper Salon, Poppystamps, Provo Craft, Stampin' Up!, Tsukineko, VersaFine | Permalink. I have made this card before. The watercolors through the window remind me of a scene from Harry Potter and The Order of the Phoenix (which would correspond to chapter 35, Beyond the Veil). Supplies: Stamp – Papertrey Ink, paper – Canson Watercolor, Neenah Classic Crest Solar White, Stampin’ Up! Basic Black, ink – VersaFine Onyx Black, die – Poppystamps, watercolors – Kuretake Gansai Tambi, embossing powder – Filigree Fine Art Powder clear. 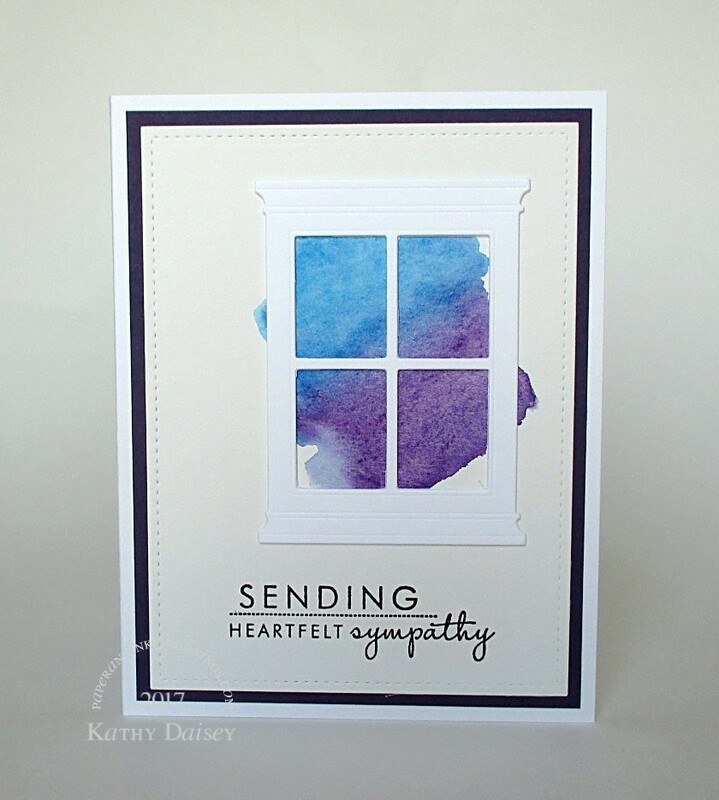 Categories: card, sympathy | Tags: Canson, card, Kuretake, Neenah, Papertrey Ink, Poppystamps, Stampin' Up!, Tsukineko, VersaFine | Permalink. Supplies: Stamps – Stampin’ Up!, paper – Gmund Royal, Neenah Classic Crest Solar White, Stampin’ Up! Real Red, inks – Stampin’ Up! Crumb Cake, Tim Holtz/Ranger Distress Inks Picked Raspberry, Spiced Marmalade, Squeezed Lemonade, VersaFine Onyx Black, dies – Poppystamps (window), Taylored Expressions (banner), embossing powder – Stampin’ Up! Sterling Silver. Categories: card, note, thanks | Tags: card, Gmund, Neenah, Poppystamps, Ranger, Stampin' Up!, Taylored Expressions, Tim Holtz, Tsukineko, VersaFine | Permalink. I created this watercolor background last week, not really having a plan for it. 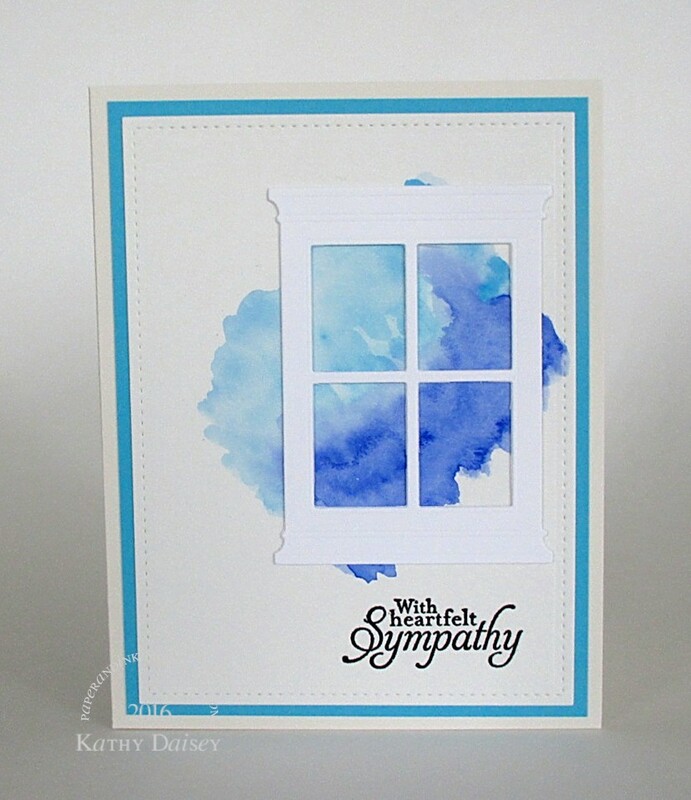 Then, sadly, I needed a sympathy card. I really like the white window frame over the color wash and creamy watercolor paper. Supplies: Stamp – Stampin’ Up!, paper – Canson watercolor, Neenah Classic Crest Solar White, Papertrey Ink Vintage Cream, Stampin’ Up! Tempting Turquoise, ink – VersaFine Onyx Black, watercolors – Sakura Koi, die – Lawn Fawn (stitched rectangle), Poppystamps (window frame), embossing powder – Filigree Fine Art Powder clear. Categories: card, sympathy | Tags: Canson, card, Lawn Fawn, Neenah, Papertrey Ink, Poppystamps, Sakura, Stampin' Up!, Tsukineko, VersaFine | Permalink. Today is the Papertrey Ink September 2015 Blog Hop Challenge . 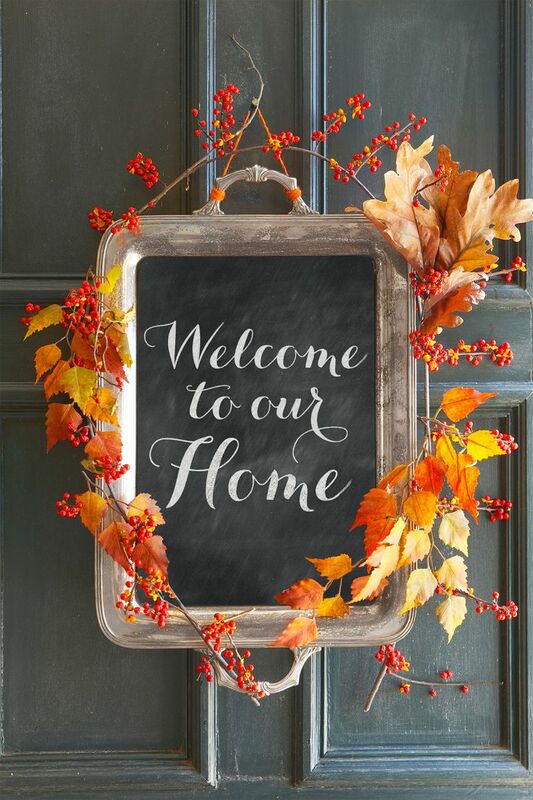 I was inspired by the door detail and the fall colors. 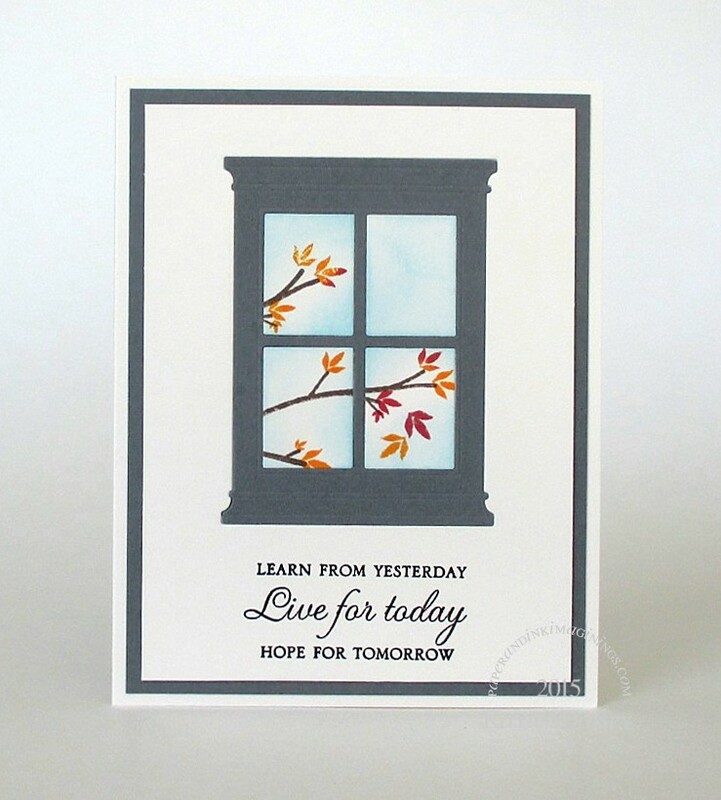 I stamped tree branches and leaves onto cream card stock, then die cut the window out of the stamped piece. I also die cut a window out of gray cardstock and my cream card front. 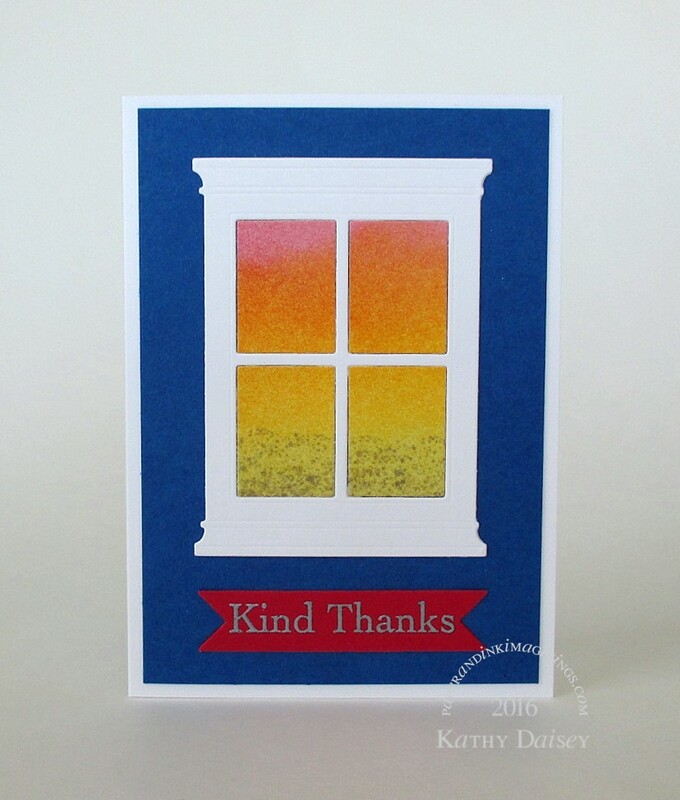 I blended ink onto the stamped window pane pieces. 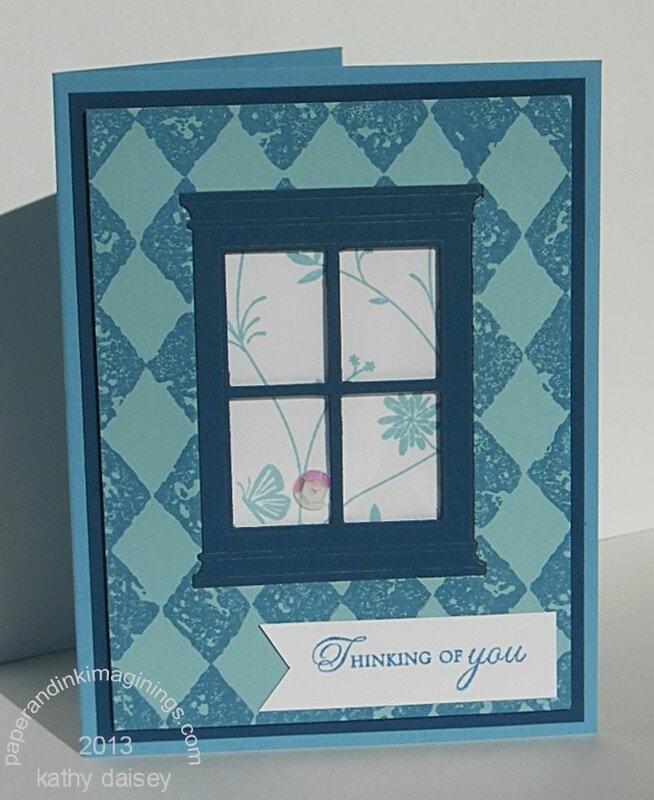 After stamping and embossing the sentiment onto the card front, I fit the gray window frame into the card front, and added the stamped and blended window panes. This inlaid design is very mail friendly! My Papertrey Ink stamps sets are Through the Trees (sentiment) and Out on a Limb. ***Edited to add: I also entered this into the AAA Cards Autumn Colors Challenge mentioned by one of my commenters. Supplies: Stamps – Papertrey Ink, paper – Papertrey Ink Vintage Cream, Stampin’ Up! Basic Gray, inks – Palette Burnt Umber, Tim Holtz/Ranger Distress Inks Fired Brick, Spiced Marmalade, Tumbled Glass, VersaMark Black Onyx, die – Poppystamps, embossing powder – Filigree Fine Art Powder clear. Categories: card, caring, encouragement | Tags: AAA Card Challenge, card, Papertrey Ink, Papertrey Ink Challenge, Poppystamps, Stampin' Up! | Permalink. I set my Madison window (die) in designer paper, I think it looks like a window in a wallpapered room. 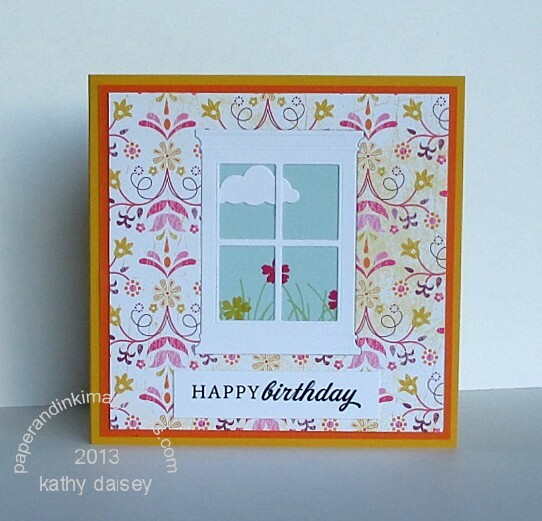 I stamped the flowers in the window view, and added a die cut cloud. Supplies: Stamps – A Muse Artstamps, Papertrey Ink, paper – Papertrey Ink White, Stampin’ Up! designer paper (retired), Crushed Curry, Pumpkin Pie, Soft Sky, inks – Stampin’ Up! Certainly Celery (retired), Crushed Curry, Melon Mambo, VersaFine Onyx Black, dies – Memory Box, Poppystamps. Categories: birthday, card | Tags: A Muse Artstamps, card, Memory Box, Papertrey Ink, Poppystamps, Stampin' Up! | Permalink. The color challenge at Splitcoaststampers this week is monochromatic (CC418 – A Midnight Muse Breeze), with the three blues: Baja Breeze, Marina Mist, and Midnight Muse. The “dessert option” is at least one gem or sequin. I have been playing with this window idea in my head for a few days (I might want to use it for a bridal shower card I am making). Two recent blog posts inspired this card. First was Julie Ebersole’s use of sequins in this post last month. The second inspiration was Taylor Van Bruggen and her sneak peek of the new Taylored Expressions “From My Window” stamp set (and coordinating die) in this post early in March. Supplies: Stamps – Papertrey Ink, Stampin’ Up!, paper – Papertrey Ink White, Stampin’ Up! Baja Breeze, Marina Mist, Midnight Muse, ink – Stampin’ Up! Baja Breeze, Marina Mist, die – Poppystamps, embossing powder – Filigree Fine Art Powder clear, clear envelope – ClearBags, iridescent sequins – source unknown. Categories: card, caring | Tags: card, Papertrey Ink, Poppystamps, Stampin' Up! | Permalink.